The Kinder – Toy Store theme is ideal for a business selling games and the related items. 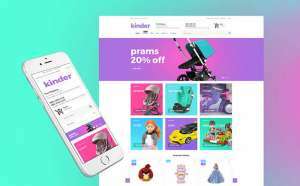 Featuring sorting options, product badges, Google fonts, alternative module layouts, Kinder has everything to make it visually appealing and user-friendly. Moreover, it offers a number of admin panel and online chat options. In addition, you can reap the benefit of multiple product display, multi-currency and a dropdown menu options with Kinder.